In a large bowl, mix together the berries with the sugar and lemon juice. Set aside until needed. In a separate bowl, whisk together the buttermilk, vanilla and 1 egg. Add all at once to the dry ingredients and stir until liquid is absorbed. Turn dough onto a lightly floured surface and knead four or five times just until it holds together. Pat the dough out until it’s about ½” to ¾” thick. With a biscuit cutter, or rim of a cold cup, cut biscuits and place on prepared baking sheet. Take the remaining egg and a pinch of heavy cream and whisk together. Brush egg wash over each biscuit and sprinkle with sugar. Allow to cool for 15 minutes before assembling. 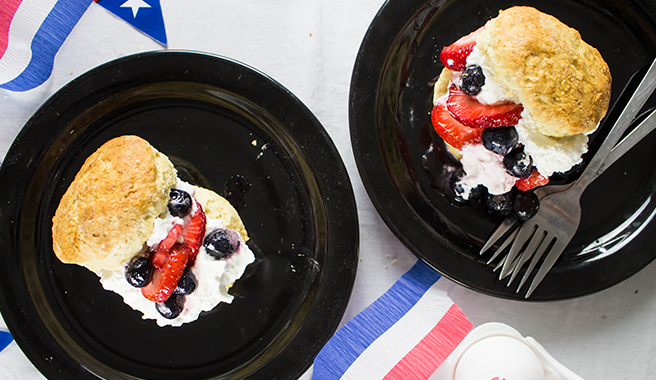 Just before serving, split open the biscuits, spoon half the berries and whipped cream on the bottom half, top with remaining biscuit halves, and spoon on the remaining berries and cream.